Thinking about what to bring to your next cook-out? These Salted Caramel Cashew Brownie Bites have a Marich Chocolates Dark Chocolate Salted Caramel tucked inside, topped with vanilla buttercream and a Marich Dark Chocolate Sea Salt Cashew. They’re the perfect bite-sized treat! This post is sponsored by Marich Chocolates. I was given product in exchange for this post, however as always, all opinions are 100% my own. Kids are out of school or will soon be. Families are planning summer vacations. And here in Phoenix, we’re looking forward to Monsoon season starting next month! When you’re used to living on the east coast with rain in the forecast every other week or so, you sort of go through withdrawal when you move to the dessert. Don’t get me wrong, I’m all about the sunshine ovah heah, but we sure do love a good rainstorm. It’s just those haboobs I can do without! I have seriously fallen in love with Marich Chocolates. I was first introduced to them through Fair Trade a few years ago when I partnered with them to do a post. I fell in love with them not only for their variety of delicious chocolates, but also because they are Fair Trade certified. This means that when you purchase a package of Marich Chocolates you’re getting a great quality product and your money for that purchase in turn will help the farmer of their ingredients. Better farming conditions, more money for the farmers to invest in their community and improve the lives of their family is something I’m all for. 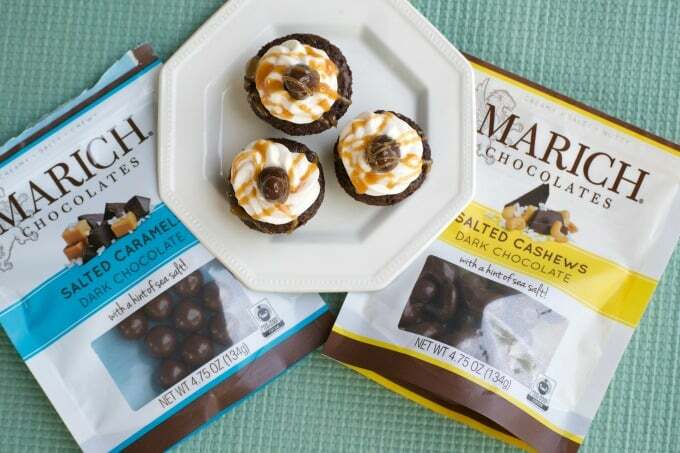 So when you buy a package of Marich Chocolates, it’s a WIN for everybody! Besides, you can treat yourself to a bag of the chocolates to eat by themselves or use them to make your desserts that much more special. I like to do both and I think you will, too. Summer is a great time to bring desserts to cook-outs. For the chocolate and peanut butter lovers, these Reese’s Peanut Butter Rice Krispies Treats will be met with a huge grin! These Lemon Coconut Sugar Cookies are just the right of tart with the perfect amount of sweet! Be the first to invite Fall to your summer BBQ with these Caramel Apple Cheesecake Bars. You won’t be leaving the party without being asked for the recipe! 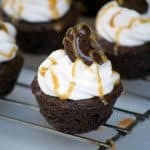 For more bite sized brownie treats, I’m looking at these Healthy Brownie Bites, I like these for a sweet treat without all the guilt. I’m seriously drooling over these Fudgy Molten Lava Brookie Cups! Holy Cow!! These Fried Brownie Truffle Bites sound like a little bite of heaven. I’d love to give those a try! For those with dietary restrictions these Gluten and Sugar-Free Quinoa Bites with Sugar-Free Ganache would be the perfect treat. Or perhaps you know someone who might enjoy these – you can surprise them! 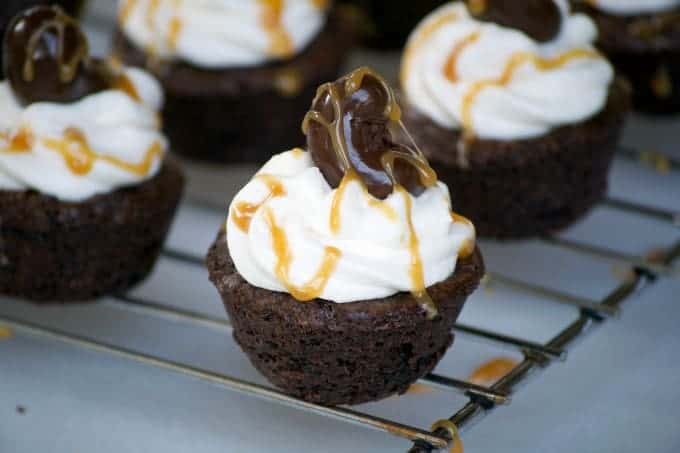 Salted Caramel Cashew Brownie Bites with a Marich Salted Caramel inside, topped with vanilla buttercream and a Marich Cashew are a great bite-sized treat! Preheat oven by preheating it to 350 degrees F. and prepare a 24-cup mini muffin tin by spraying it with cooking spray. In a large bowl, combine the ingredients as directed for the box of brownie mix. Fill each muffin cup so that each is 3/4 full. Bake for 18 - 21 minutes, or until a toothpick inserted into the edge comes out clean. 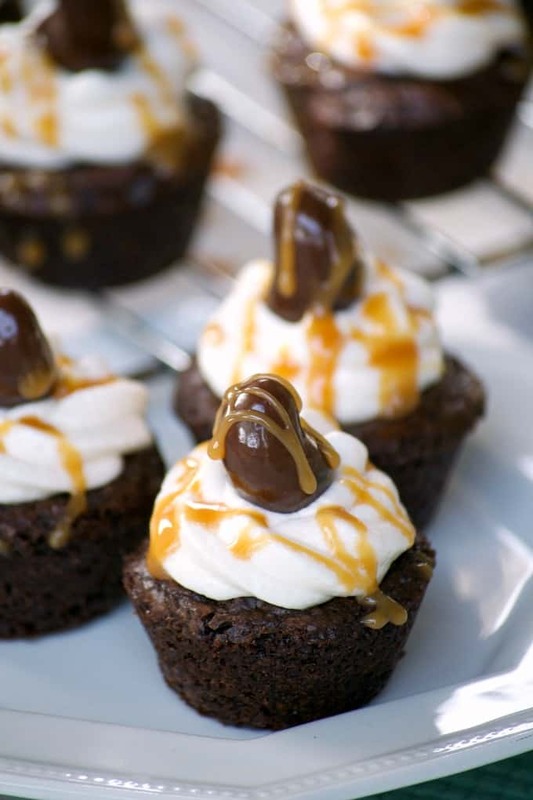 Allow tray to cool on a wire rack for about two minutes before inserting a March Salted Caramel into each brownie. Cool brownies in pan for an additional 10 minutes. Remove to cool completely on a wire rack before frosting. Continue with remaining brownie batter. In a mixing bowl, cream the butter until smooth. Add the vanilla and powdered sugar, one cup at a time. Mix in the two tablespoons of milk until smooth and creamy. If needed, add the additional tablespoon of milk, one tablespoon at a time until frosting no longer appears dry. Using a small plastic bag or piping bag, frost the brownies. Place one Marich Salted Cashew on top of the frosting and drizzle each with the salted caramel topping.